The photo at right is one of the best-known residents of South Florida, the Alligator. 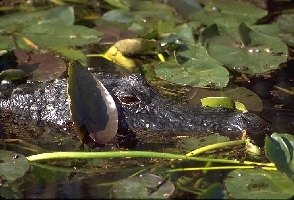 This photo was taken in the Shark Valley area of Everglades National Park on Feb. 2, 2000. My capital theory book with Bob Becker, Capital Theory, Equilibrium Analysis and Recursive Utility is published by Blackwell. It is available from amazon.com. The ISBN is 1-557-86413-6. You can read the preface, and peruse the table of contents here. The book contains a large number of worked examples. The major ones are listed in the list of examples. The errata sheet was last updated June 30, 1998. You will find here my curriculum vitae in PDF (Acrobat) format, a set of abstracts for my papers, downloadable copies of four working papers, and the information on the book Bob Becker and I have written, Capital Theory, Equilibrium Analysis and Recursive Utility. Vacation accounts and photos: Rockies 2002, Utah 2003, Costa Rica 2004.